piper and leo | destined to be together. Which picture of Paige do you like better? How many series are there of charmed? I made this ícone and I forget what episode it is from. Could someone ID it for me? Thanks! jovens bruxas is a show about three estranged sisters named Prue (Shannen Doherty), Piper (Holly Marie Combs), and Phoebe (Alyssa Milano) who discover they come from a long line of powerful witches and are known to evil as The jovens bruxas Ones. Despite being witches, they also have problems when it comes to love. During its eight season run, the fantasy-drama "CHARMED" has occasionally featured an episode dealing with the topic of time travel. These time travel episodes usually prove to be well-written or exceptional. However, there comes a time when the series produced a time travel episode that end up being a dud. The series' Season Six episode, (6.11) "Witchstock" proved to be the latter. Now I know a lot might not have noticed but as a huge fãs of both shows, I noticed that there a lot of similarities between the two shows. 1.both set siblings who fight the evil sobrenatural (demons/vampire/evil witches...). 2. both set of siblings save/protect people in the expense of their own lives. 3.both set of siblings lost their mothers at young age to the supernatural. 1. 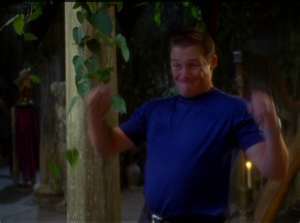 (2.12)"Awakened" - After purchasing illegal frutas from South America, Piper is infected with a deadly and rare disease called "Arroyo Fever". Prue and Phoebe use an "Awakening" spell to cure her, but the spell backfires with deadly results. "CHARMED" RETROSPECT: (2.14) "Pardon My Past"
(2.14) "Pardon My Past" is an episode from Season Two of the TV series, "CHARMED" (1998-2006). In it, one of the jovens bruxas Ones – Phoebe Halliwell - is haunted por a spirit from her past life. The past life turned out to be one P. Russell, a first cousin of the Halliwell sisters' great-grandmother. "CHARMED" RETROSPECT: (1.22) "Déjà Vu All Over Again"
When I first saw (1.22) "Déjà Vu All Over Again", the Season One finale for "CHARMED", I promised myself that I would never watch another episode of the series again. Never. Yet four months later, I broke my promise and resumed watching the series for another three-and-a-half seasons. Phoebe Halliwell: We're the protectors of the innocent, we're known as the jovens bruxas Ones. Phoebe Halliwell: I never touched Roger. Piper Halliwell: It doesn't matter because nothing happened... Right, Phoebe?... when you did the incantation? Phoebe Halliwell: Well, my head spun around, and I vomited dividido, dividir ervilha soup. How should I know? (6.17) ”Hyde School Reunion” is an episode from Season Six of the TV series, ”CHARMED” (1998-2006). It is viewed as controversial por many fãs of the show. I wish I could say that its controversy revolved around any innovative storytelling. I wish I could say this . . . but I cannot. Because ”Hyde School Reunion” is without a doubt one of the worst ”CHARMED” episodes to air on television. This artigo is for fãs of the ONE AND ONLY TRUE jovens bruxas like myself about our favorito show. a pop quiz question foi adicionado: Who was the first sister to be turned into something? a pop quiz question foi adicionado: Who said this line: I'm sorry. I didn't get that last platitude. a pop quiz question foi adicionado: Who said this: That's a good reason, I guess. Who told Leo that being on the side of The jovens bruxas Ones was what was best for him? Let`s reach 20. 000 fãs ! why did people HATE prue????????? ?